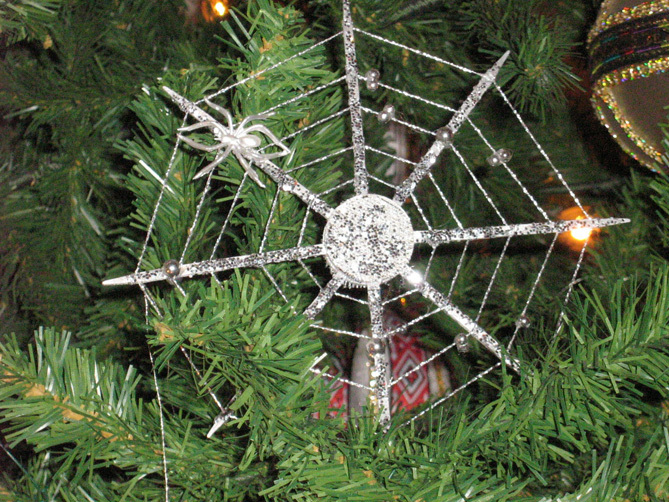 The spider-web-covered “yalynka” (Christmas tree) is now a standard Ukrainian Christmas story. It comes in many versions, and has appeared in a number of contemporary children’s books. Basically, a poor family has nothing with which to decorate their yalynka and, hearing this, a spider overnight spins its web all over the tree, making the spiderweb sparkle and glitter in the morning sunlight. This explains the tradition of tinsel on the Christmas tree. The various embellishments of the story depend upon the teller and the tale. Another version has the Holy Family hiding in a cave during their flight to Egypt. The benevolent spiders spin webs and cover the whole entrance to the cave. When Herod’s soldiers pass by, they do not bother searching the cave, because obviously it has not been disturbed in a long time – and the Holy Family is safe. Now, a few things need to be clarified. First of all, the custom of the Christmas tree arrived in Ukraine from Germany in the 19th century. 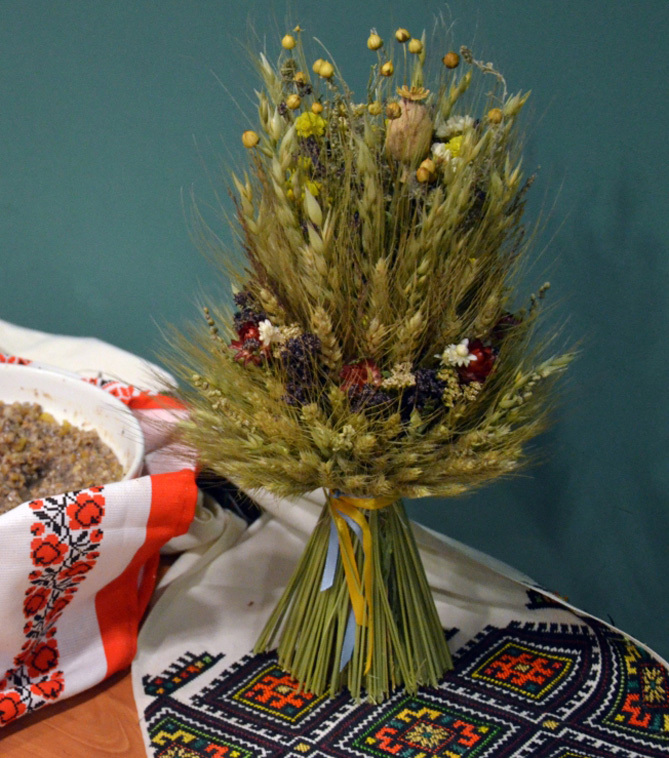 It became a supplement to the Ukrainian “didukh,” the sheaf of wheat and other best grains, which symbolizes Ukrainian Christmas. The spirits of the ancestors come into the home in the didukh for the holy days. They had lived in the fields in the grain helping the bountiful harvest. The didukh is symbolic, the yalynka is decorative. Being both a fan of spiders and wheat I can only hope that Ukrainian Christmas traditions will make their way west. 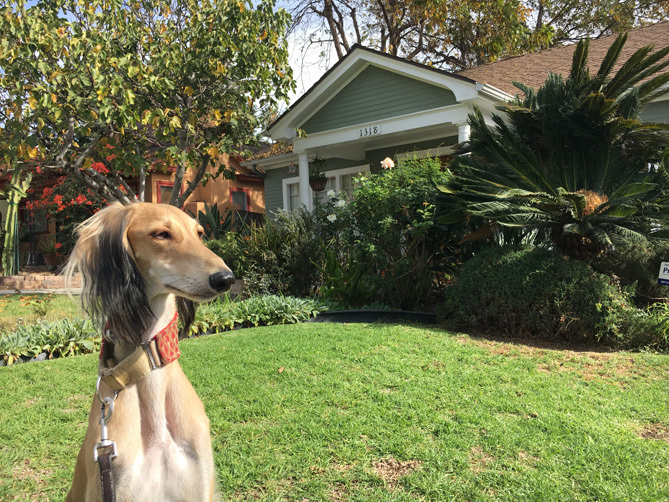 On the Root Simple Podcast this week, Kelly and I discuss fire safety problems caused by open floor plans and modern materials and Kelly shares her favorite dog sports (picture above is of our Saluki Ivan in front of a neighbor’s non-open floor plan house). During the podcast we refer to our open floor plan fire safety rant, “Your Open Floor Plan is a Death Trap,” as well as Shigeru Bans’ wall-less house. Then we get to chatting about dog sports including canine nose work, agility, lure coursing, obedience and barn hunting. Tree cavities are the natural living quarters for honey bees. I occasionally get calls asking if I can remove bees from a tree. I usually say no because the process is labor intensive and dangerous if the bees are up high. I tell people to just leave them. If they aren’t bothering anyone who cares? 1. First I told her that when I was done removing the bees she needed to contact a certified arborist. A cavity is often a sign of a disease that could suddenly and unexpectedly cause a huge limb to break off. 2. Back in my workshop I made a simple one-way exit cone out of 1/8 inch hardware cloth. 3. I called up my beekeeping friends Max and Kirk to get some brood comb. Brood comb is comb with bee eggs in it. They gave me a frame of brood comb along with the nurse bees that were hanging on it. 4. 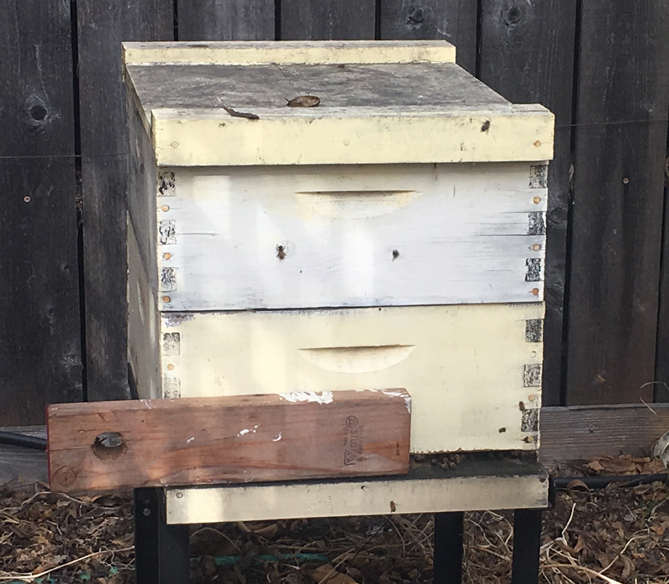 I made a platform for a medium box, put the brood comb in it and quickly attached the exit cone to the tree with the end of the comb right next to the bee box. The bees leave the tree through the exit comb but can’t get back in. Instead, they take up residence in the box with the the brood comb (they are attracted to the smell of the brood comb). The workers will use the brood comb to make a new queen or sometimes the queen in the tree will migrate out to the new box. The whole process takes six weeks and requires frequent checks to make sure that the bees haven’t figured out another way out of the tree. At the end of the six weeks I came back and took the box back to my apiary. In the Facebook live video above you can see the trapout just minutes after I attached the one way exit cone. The bees can be a little cranky for the first few days after the trapout begins. And this is a good opportunity to warn again about bee removal scammers who promise you that they can do a live removal of bees from a tree quickly by “smoking them out” or some other such nonsense. What they are likely doing is spraying the hive with a product called Bee-Quick that commercial beekeeper use to drive bees out of honey supers. Unfortunately, spraying Bee-Quick into a tree and driving the bees out, with no resources, is really no different than exterminating them. The beekeeper you hire for a tree removal should suggest a trap-out or simply leaving them alone. If the tree is being cut down it’s possible that the section with the bees can simply be relocated or if the hole is large enough to reach into, a cutout can be done. The 2×4 is my crude way of making the entrance smaller. When a hive is getting established a smaller entrance is easier to defend against other bee colonies in search of free honey. My new “tree bees” seem healthy and are already expanding into a second box.